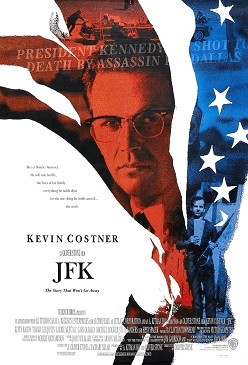 Is Oliver Stone’s alternately lionized and condemned film about a dubious criminal investigation into the assassination of President John F. Kennedy a document of accurate historical truth? Obviously not. It could never be, just as no overarching narrative of the JFK assassination (the now widely-discredited Warren Report quite included) ever could be. There is so much that is unknown, that never can be known, about what really happened in the lead-up to and aftermath of that dark sunny day in Dealey Plaza in Dallas, Texas on November 22nd, 1963. It’s a tragedy (or a crime) all the more resonant for its lack of an explanation or even, really, a moral lesson. Stone and his co-writer Zachary Sklar were aware of this very dissatisfying fact and based this definitive fiction film about the assassination upon not only the detailed uncertainty around this defining event of 1960s America, but also on the nagging malaise that underlies it. The more information that one uncovers when digging into the deep scholarly lore of the assassination, the less answers are revealed and the more questions are raised. JFK is not reducible to a mere conspiracy theory because of this keen appreciation of how epistemology actually tends to operate. We are told repeatedly by the liberal-humanist heteronormative order that knowledge is power, but just as often knowledge is a rabbit-hole with many twists and turns and dead ends but with no exit. Information and evidence in great overflowing excess, as Borges depicted in The Library of Babel and as Oliver Stone depicted in JFK, offers no resolutions, only the promise of an inescapable intellectual morass. Stone called JFK a “counter-fiction” to the official “fiction” provided by the American government and its servile media. In a manner commensurate with the comforting propagandistic grand myths of American greatness favoured by the Straussian neo-conservatives who were scratching at the doors of power during the George H.W. Bush Administration in office when the film came out (and who had their feet up on the furniture in the Administration of Bush’s son a decade later), Stone sells a myth (which is a really just a polite and grandiose word for a lie) that suggests profound reserves of healthy distrust for the military-industrial complex that we see Dwight Eisenhower warning about in the film’s opening moments. If there is no smoking gun for Stone to enter into onscreen evidence, then controversial New Orleans District Attorney Jim Garrison (played with an avuncular Southern determination by then-superstar Kevin Costner) never quite found one either. The closest he came, and the moment JFK focused on with a cultural-meme-inspiring zeal (although the Seinfeld parody helped that cause), is the famous “Back… and to the left.” This interpretation of the key, fatal moment on the Zapruder film of the shooting boils down the impressively labyrinthine outpourings of information, data, and suggestion into a point of concrete self-evidence that could not be mistaken. Crystallized in this one instance was more than government cover-ups and anti-Castro counter-intelligence and military paranoia over Vietnam, the cocktail of motives unveiled for Garrison by Donald Sutherland’s Mr. X like Dante being taken on a guided tour of the inner circles of Hell. In easy-to-grasp terms, “Back and to the left” showed that, as so many have long suspected, not all was as we were told it was. Indeed, it was much more as it seemed. Politics and “accuracy” aside, JFK is often a mesmerizing film, most particularly in its most complicated, info-rich sequences, where Stone’s Oscar-winning editors Joe Hutshing and Pietro Scalia interweave visual information like master painters (cinematographer Robert Richardson also won an Oscar for his work here). Wonderful performances from an all-star cast abound as well. Recognizable faces from Joe Pesci to Jack Lemmon to John Candy to Kevin Bacon (this is an indispensible title for the Six Degrees game) and beyond slide into the film, craft memorable characters at lightning speed, and slip out again, only to return when they’re most required (or, maddeningly, when they aren’t). And Gary Oldman’s eerie, complex depiction of Lee Harvey Oswald in flashbacks and reconstructed archival footage is a must-see. He embodies the self-proclaimed patsy and publically-condemned lone gunman as he has become: a haunting spectre in the echoing halls of the American historical psyche. If it’s even possible to leave aside the contentious, tangled underpinnings, try to do so. As pure filmmaking, JFK is as skilled and transporting as it gets. It may all be a lie as well, but, if so, what a huge lie; and you know what Hitler told us about “the Big Lie”, after all. So let his film’s critics flail away about conspiracies and fabrications and use the noun/adjective “crackpot” until it ceases to have even the slightest rhetorical meaning. Oliver Stone’s convoluted, untouchable cinematic myth stands above the fray, its virtuoso paranoia and troubled patriotism tapping into the swirling popular discontent concerning the official version of the events and painstakingly crafting a compelling myth of its own in response.